(Bloomberg Opinion) -- Each year about this time, Wall Street celebrates a kind of madness that has nothing to do with college basketball. 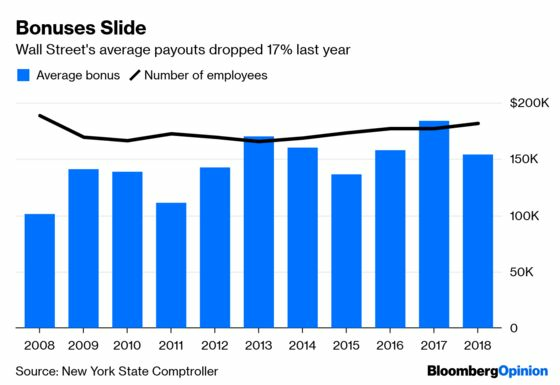 It is bonus season, and the enthusiasm is understandable, given the widespread participation in the estimated bonus pool of $27.5 billion for workers in New York’s financial industry. Despite that heft, the 2018 numbers that just came out might be a little disappointing to some. The average bonus fell 17 percent to $153,700 a person, the first decline in three years. Given that the stock market last year endured the steepest slump since the financial crisis, that decline should come as no surprise. The bonus pool is also spread over a larger base of workers. What does surprise many people is how steady the bonuses have been during most of the past decade as the chart below shows. Pressure on fees and underperformance by alternative investments seemed to play little role in year-end payouts. Some analysts had been forecasting higher bonuses for 2018 as late as November. Perhaps they were expecting more private-equity transactions and a late surge in initial-public offering underwriting. Or, at the time, they had yet to take account of the severity of the fourth-quarter market plunge and its impact on equities sales and trading profitability. Regardless, whenever bonus season rolls around we see all sorts of articles criticizing financial-industry pay. But if you believe that workers in a capitalist economy should be compensated based on merit, i.e., how much they contribute to the profitability of their employers, then the criticism about bonuses is misplaced. This isn’t to say that debate about wealth taxation and income inequality isn’t legitimate. It surely is, but that’s another discussion. Instead, I’d like to explain why financial firms have come to the rational conclusion that employee bonuses need to be so large. The explanation for this is straightforward. Let’s use stock or bond traders as an example. Their job is to put capital at risk to generate trading profits. Usually, they earn a relatively modest base salary, plus some share of the profits they generate, which often can make up the bulk of their total pay. But even the best traders can have losing streaks. In any calendar year, someone can start out hot, but later lose much of the profits they generated. There also is the possibility that they lose money. No one who generates losses expects to get paid a bonus. Then there is the issue of asymmetrical incentives. Most financial firms try — not always successfully — to limit the possibility of an incentive system that encourages traders to generate big returns by embracing lots of risk. Once traders figure out they can capture all of the upside but face few consequences when they lose money, it creates an environment that can lead to disaster. When done right, the compensation structure encourages traders to take the appropriate amount of risk. Thus, much of what the outside world sees as outlandish and outsized bonuses are for the most part deferred profit-sharing. But no system is perfect. If a firm as a total has a bad year, but an employee has a good one, they may not receive a bonus as large as expected. Traders are nothing if not entrepreneurial, and scenarios like this can go a long way toward explaining why you often see traders jump from one firm to another. Consider also why base pay is relatively low on Wall Street. It effectively ensures that employees stick around for at least a year until bonus time, thus slowing job hopping. I also suspect the delay in paying bonuses give firms an extra three months to assess whether trades incurred losses, with adjustments to bonuses made accordingly. Regardless, bonuses are big because the financial industry makes a lot of money and distributes a large share of the income stream to talented traders who might well make a lot of money in some other field. There’s a lot of competition for skilled workers and any pay regimen that didn’t take account of this would put the industry at a disadvantage versus those that did.